True clarity requires more than just conventional Anti-Reflective (AR) lenses. It requires the toughness to meet the challenges of daily life. ZEISS DuraVision Platinum lenses are designed to provide sharp clarity, be tough with easy to clean dirt-resistant lenses. What makes ZEISS DuraVision Platinum AR lenses different? ZEISS DuraVision Platinum has been designed using an integrated system of coating layers that have been densely packed using ion-assisted deposition and resulting in a lens surface that is three times tougher than the previous generation of ZEISS AR. No other AR coating offers better scratch protection. ZEISS DuraVision Platinum AR lenses also have a more cosmetically pleasing, blue residual reflex color that reduces reflectance by over 20% compared to conventional green AR coated lenses. 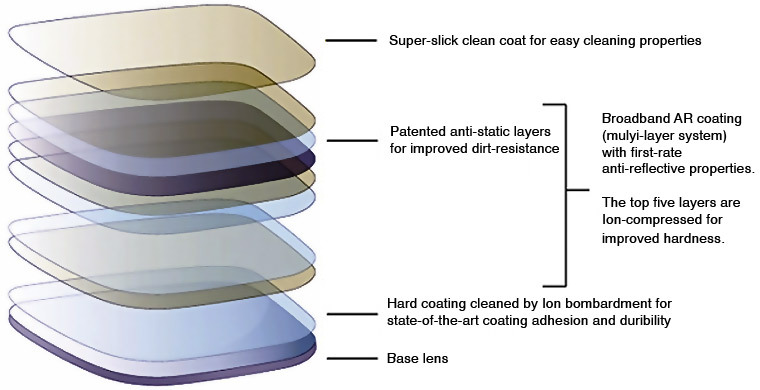 ZEISS DuraVision Platinum is made up of nine ultra-thin layers, an integrated system of coating layers densely packed using ion-assisted deposition results in a lens surface that is three times harder than the previous generation of ZEISS AR lenses. Wiping a lens with a cloth creates static electricity, which attracts dust. DuraVision Platinum’s patented anti-static layer decreases the buildup of static electricity by over 90%, dramatically reducing dust on the lenses and keeping them clearer longer. The true measure of AR clarity is luminous reflectance: the lower the reflectance, the greater the clarity. The unique blue reflex color of ZEISS DuraVision Platinum reduces luminous reflectance by over 20% compared to conventional green AR-coated lenses. The result is sharper vision, particularly in high-glare conditions like driving at night or working on a computer. New ZEISS DuraVision Platinum AR lenses are 3 times harder than the previous generation of anti-reflective (AR) lenses.